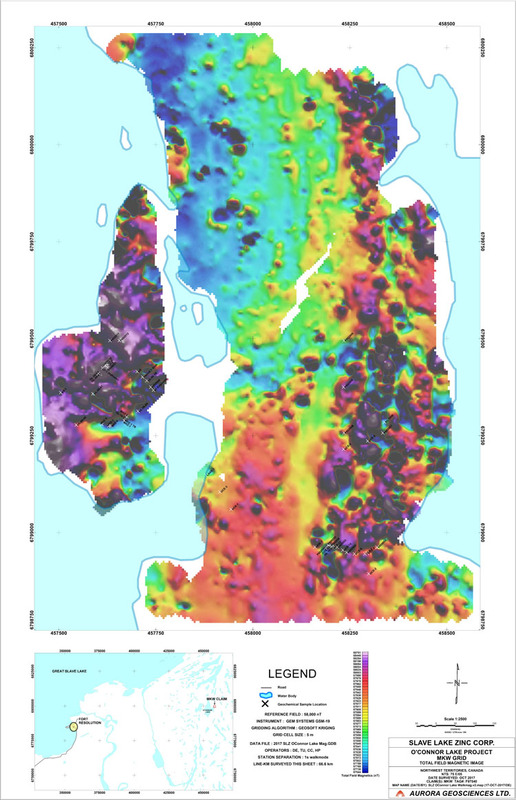 The O’Connor Lake area is located near the western margin of the Taltson Magmatic Zone. Oldest rocks are Archean, supracrustal and strongly metamorphosed paragneisses and schists with minor amounts of lesser deformed greywacke, argillite, shale and quartzites. Small granitic lenses and pegmatite bodies and pegmatite injections commonly occur in the paragneiss. Interbanded within the paragneiss and metasediments are small bodies of metavolcanics and amphibole gneiss with minor banded iron formation and ultramafic rocks. A massive granodiorite-granite intrusive complex borders the supracrustal units to the west. Xenoliths of amphibolite and paragneiss commonly occur within the intrusives. Granodiorite portions contain biotite, hornblende and a pink microcline as porphyroblasts. The intrusive rocks are medium grained, weakly foliated and usually grade into less mafic granitic rocks. East of the granodiorite complex is a medium to fine grained, foliated biotite monzogranite containing xenoliths of metasediments and amphibolite. Small irregular muscovite granite bodies occur cutting metasediments, metavolcanics and monzogranites. This granite is composed of quartz, microcline, orthoclase, muscovite and biotite and associated pegmatites commonly contain very coarse-grained muscovite. Fine grained aphanitic northwesterly trending diabase dykes cut all the units. These dykes vary from 1 to 40 meters in width and have been dated at 1,700 Ma. Quartz-carbonate veins from 0.5 to 3 meters in width are present crosscutting the entire lithology, including the dykes. These fissure type veins generally have a northwesterly orientation and host zinc, lead, copper, silver and gold sulphide showings. Two vein systems at the MWK property were explored by American Yellowknife Gold Mines in 1951-1952. The number 1 vein was explored with 55 core drill holes, surface trenching, bulk sampling and sinking a 180-foot three compartment shaft with 330 feet of drift. Drilling the vein system indicated that the mineralized section at depth exceeds 600 feet in length with multiple phases of sulphide mineralization. The number 2 vein system was explored with trenching only in 1952 some 450 meters southeasterly from the number 1 zone. Other vein systems were noted at the time and were assigned a lower priority. Slave Lake Zinc has taken samples from the old trenches on both veins and confirmed the original 1951/1952 results. The Company also completed a magnetics geophysical survey to trace the known zones. The number 1 vein may occur in a splay fault related to a major local structure containing the number 2 vein system. The vein systems represent typical open-space filling fissure veins. They are considered to be of hydrothermal origin (after Prusti, 1954). The quartz is commonly coarsely crystalline with cockade or comb structures. Common gangue minerals include fluorite, apatite and adularia and the host rock is typically weakly hydrothermally altered in areas of mineralization.